In the past 2 months I have joined 4 different groups of which three are baking challenges. Trying to meet the deadlines sometimes does get a bit daunting especially when you have to deal with your daily routine and the challenges. However, these challenges have given me the opportunity to try out recipes that have been in the ‘to try list’ for too long or get to learn a completely new dish from different cultures. I got tempted to try all the recipes but that would mean that I may get so engrossed in baking that I may forget to make lunch or dinner. But on a serious note, I will eventually try most of them. In the meantime here is my recipe for pizza rolls from scratch. Mix both the flours in a big bowl. Add salt, sugar, mixed herbs and the yeast and mix. Knead the dough for 5 to 7 minutes till it is smooth and silky. Form the dough into a ball and rub oil over it. Lightly grease the bowl with oil. Put the dough in it. Cover it with cling film and keep it in a warm place for 1½ – 2 hours till the dough rises. It should become double the original size. In the meantime prepare the filling and sauce. Add onion and garlic and stir fry for a minute. Add the mushrooms and stir fry for 2 minutes or till they are just about to wilt. Add the corn and take the pan off the heat. Add salt, pepper and chilli flakes. Roughly tear the basil leaves and add to the filling. Add the onions and saute till they are soft and transparent. Add the garlic paste and stir fry for a few seconds. Add the tomato puree and mixed herbs. Cover the pan and let the sauce simmer for nearly 15 to 20 minutes or till it becomes thick. Remember to stir the sauce occasionally so that it does not stick to the bottom of the pan. When the sauce becomes thick, add salt, pepper and the basil leaves. Lightly grease 2 baking trays with oil or cover it with aluminium foil. Knead the risen dough gently and divide it into two parts. Dust the work top or a big board with some flour. Roll one part of the dough into a rectangle of about 13 X 10 inches. Sprinkle the rolled dough with half of the grated cheese. Scatter half of the filling over it. Starting from the widest side, roll the dough up with the filling like a swiss roll. Cut slices, about an inch thick. Place the slices on the greased tray. Gently press each roll down, very gently. Repeat steps 5 to 11 with the remaining dough, filling and cheese. Top each slice with a little bit of grated cheese if you like. Place the trays in the oven and let the rolls bake for 15 to 20 minutes or until they appear light golden brown. Remove the rolls from the tray and let them cool a bit on a wire rack. Serve the pizza rolls with marinara sauce. Use dry herbs if you don’t fresh basil. Add filling of your choice like peppers, zucchini, etc. Use a cheese of your choice. Remember to seal the end well, otherwise the rolls will open up during baking. I rubbed a bit of water at the edge to seal it well. I added the salt to the cool vegetable so that it does not become watery. To make fresh tomato puree, I usually cut tomatoes into half and put it into a saucepan. I add about ¼ cup water and cover the pan. Let the tomatoes cook till they become soft. When they become a bit cold, liquidise it. 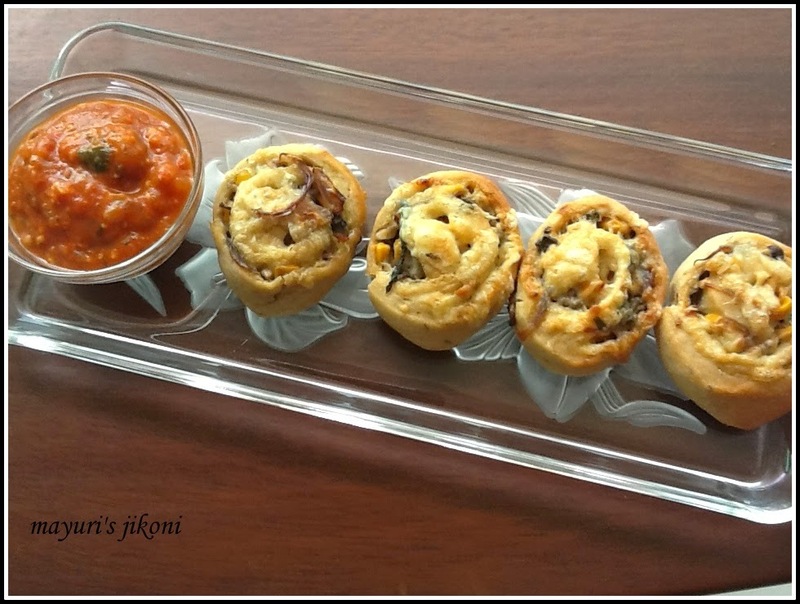 I delicious pizza rolls….. Looks super yummm, I'am drooling now!! Delicious pizza rolls…… Looks super yumm, I'am drooling now!